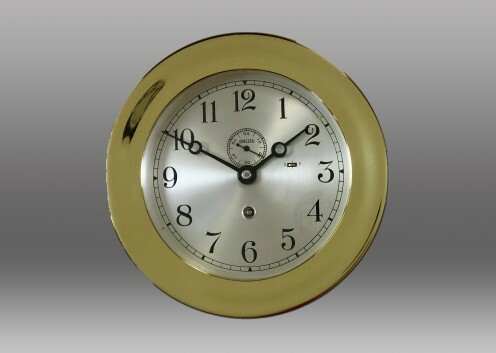 This 6” Marine Mechanical Clock was originally sold to Gulf Shipbuilding Corporation on August 25, 1944. Features solid forged brass screw case and bezel and hand-silvered brass dial with 12-hour time with black numerals. The 12E movement (time-only mechanism) has been completely overhauled, including the refinishing of the dial, hands and reflector. Serial #458312.